Update: The Constantine Auto Theatre is listed as open in the 1948-49 and 1950-51 editions of the Theatre Catalog The 1948-49 edition lists the Constantine as being on Route 131, having 125 car capacity and the owner is Hal Lego. It operates 7 months per year, seven nights a week, plays single and double features and changes its features three times a week. The 1952 edition lists the Constantine as being closed, and there is no listing in the 1953-54 or subsequent editions. (Michigandriveins. 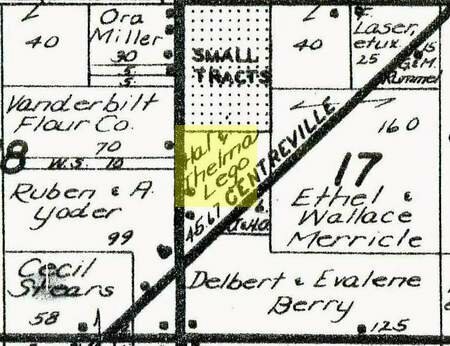 com 4-17-05) Update 2: The actual location of the Constantine Auto Theatre, which was owned by Hal Lego, was found in the 1955 and 1961 St.
Joseph Co. Farm Plat Books (Image 1). 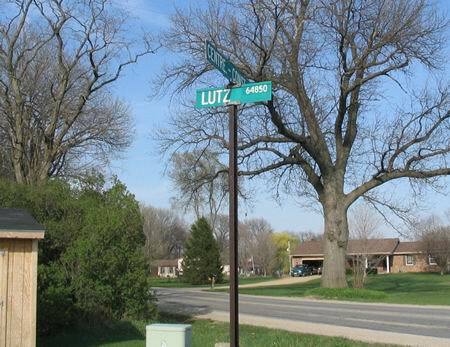 The drive-in was located at the Northeast corner of Lutz Rd. and Centerville-Constantine Rd. The site is shown, highlighted in yellow, in the aerial photograph below (Image 2). As there is no Topo image of the Auto site availible, we created one a Photoshop rendering (Image 3) to illustrate one possible placement of the drive-in footprint on this piece of property. (Michigandriveins. com 4-17-05). 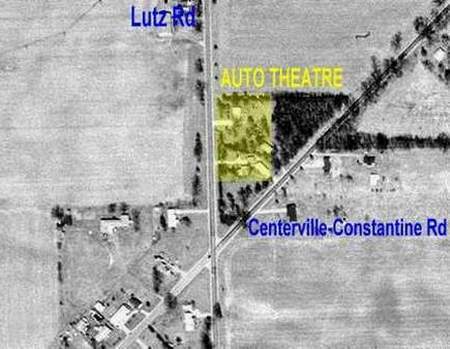 According to the description, the theater was at the corner of Lutz Road and Centerville-Constantine Road. There seems to be nary a trace left. Quelle surprise. Auto Theatre to Open July 3 Constantine Advertiser-Record - Wednesday June 30, 1948 - Page 1 Constantine and surrounding territory this week will have an auto drive-in theatre, the new motion picture fad now going across the country. Hal Lego, builder and owner of the Constantine Auto Theatre, this week announced that the new project will open to the public beginning July 3. The shows will start at 8:30 each night. The Constantine Auto Theatre is located three miles east of Constantine on old US-131, at the intersection of that highway and the Centreville - Constantine road. A large screen and projection house have been erected, and the workmen are busy getting the final work done before Saturdays opening date. The C A T opened on July 3rd 1948 and apparently closed on September 1, 1949. (I dont have my notes with me as I type, but the 9/1/49 date may be the day the last ad appeared). No ads or articles appear in the Constantine Advertiser-Record beyond 1949. Another mystery SOLVED. Very little is known about this drive-in. In fact, it is not known that it existed at all although it shows up on many drive-in sources.